Goodwill Industries International Inc., or shortened to Goodwill, (stylized as goodwill) is an American nonprofit 501(c)(3) organization that provides job training, employment placement services, and other community-based programs for people who have barriers preventing them from otherwise obtaining a job. In addition, Goodwill Industries may hire veterans and individuals who lack education or job experience or face employment challenges. Goodwill is funded by a massive network of retail thrift stores which operate as nonprofits as well. Goodwill's answer to its profit status is "As a unique hybrid called a social enterprise, we defy traditional distinctions. Instead of a single bottom line of profit, we hold ourselves accountable to a triple bottom line of people, planet, and performance." Goodwill operates as a network of independent, community-based organizations in South Korea, Venezuela, Brazil, Mexico, Panama, Uruguay, the United States, Canada, and 8 other countries, with 162 local Goodwills in the United States and Canada. It slowly expanded from its founding in 1902 and was first called Goodwill in 1915. In 2014, Goodwill organizations generated a total of $5.59 billion in revenue, 83 percent of which was spent directly on programs. In 2015, the group served more than 37 million people, with more than 312,000 people placed into employment. Goodwill's logo is a stylized letter g, resembling a smiling face. It was designed by Joseph Selame in 1968. Currently, there are two public faces of Goodwill. Organization expert Lorie Marrero is the face of the Donate Movement, which began in 2010. ABC correspondent Evette Rios partnered with Goodwill in 2012 to help appeal to the Latin American market. In 1902, the Reverend Edgar J. Helms of Morgan Methodist Chapel in Boston started Goodwill as part of his ministry. Helms and his congregation collected used household goods and clothing being discarded in wealthier areas of the city, then trained and hired the unemployed or impoverished to mend and repair them. The products were then redistributed to those in need or were given to the needy people who helped repair them. In 1915, Helms hosted a visit to Morgan Memorial by representatives of a workshop mission in Brooklyn, NY and they learned about the innovative programs and the operating techniques of the "Morgan Memorial Cooperative Industries and Stores, Inc." Helms was subsequently invited to visit in New York. Out of these exchanges came Brooklyn's willingness to adopt and adapt the Morgan Memorial way of doing things, while Helms was persuaded that Brooklyn's name for its workshop, "Goodwill Industries," was preferable to the Morgan Memorial name. Thus was officially born Morgan Memorial Goodwill Industries, and that, plus Brooklyn's interest and ties, became the foundation on which Goodwill Industries was to be built as an international movement. Today, Goodwill has become an international nonprofit that takes in more than $4.8 billion in annual revenue and provides more than 300,000 people with job training and community services each year. Helms described Goodwill as an "industrial program as well as a social service enterprise." In 1999, over 84 million pounds of used goods were donated to the stores in Portland, Oregon, part of the Goodwill Industries of the Columbia Willamette (GICW). Around the same year, Goodwill launched the first nonprofit Internet auction site in the United States. By 2006, Goodwill Industries International had a network of 207 member organizations in the United States, Canada, and 23 other countries. As of July 2011, there are 164 full Goodwill members in the United States and Canada. These are each independent social enterprises that operate their own regional Goodwill retail stores and job training programs. Morgan Memorial Goodwill Industries, Boston, is the enterprise operated in Boston, where Goodwill was founded. The clothing and household goods donated to Goodwill are sold in more than 3,200 Goodwill retail stores, on its Internet auction site shopgoodwill.com, as well on eBay by a number of its regional stores. Most of the items on shopgoodwill.com are items that are considered most valuable. Each regional store will ship out what they deem valuable so that the items will be purchased for what they are worth. Antiques, collectibles, jewelry, comic books, furniture, and even automobiles are some of the items found on this website. The revenues fund job training and other services to prepare people for job success. Examples of Goodwill's presence on eBay are Goodwill Industries of Maine, Seattle, San Francisco, and many other locations. Goodwill locations that operate on eBay research donated items for higher profit than could be brought in-store, and instead list those items on eBay for auction. In 2010, through their involvement in Goodwill's programs, more than 170,000 people were placed into employment. They earned $2.7 billion in salaries and wages, and as tax-paying citizens, they contributed to the community. Goodwill also generates income to help businesses and the federal government fill gaps caused by labor shortages, time constraints, and limited space or equipment. Local Goodwill branches train and employ contract workers to fill outsourced needs for document management, assembly, mailing, custodial work, grounds keeping and more. Goodwill claims that more than 84 percent of its total revenue is used to fund education and career services and other critical community programs. In 2010, Goodwill provided people with training careers in industries such as banking, IT and health care, as well as offering English-language training, education, transportation, and child care services. When merchandise cannot be sold at a normal Goodwill store, it is taken to a 'Goodwill Outlet' or 'Bargain Store.' Items are mostly sold by weight, with prices ranging from $0.49 to $1.69 per pound, depending on the location. The wide selection and massive discounts on a variety of household goods typically attract a fervent following of regular customers, some of whom make a full-time living buying and re-selling goods. There are also many vendors who buy this merchandise in bulk, and they send the merchandise to third-world countries. Charity Watch rates the Goodwill Industries an "A". In January 2016, Goodwill Industries of Toronto, Eastern, Central and Northern Ontario closed its 16 stores and 10 donation centres after 80 years of operations, citing cash problems. The six other Canadian Goodwill Industries Branches remain operational. In November 2010, for the first time, Goodwill opened a store in San Francisco, California, specifically designed to hire employees who are transgender, gay, or lesbian. The temporary or "Pop-up" store was a unique partnership between Goodwill of San Francisco and Transgender Economic Empowerment Initiative. The Castro Pop-up store closed in April 2011, but the staff was transferred to various Goodwill stores throughout San Francisco. Goodwill Industries International and Goodwill Industries of Central Texas (Austin) hosted their first pop-up retail shop, POP!, at South by Southwest in 2013. Goodwill has been around for more than 110 years, but in recent years has revamped its retail strategy to include boutiques, trunk shows and other venues that appeal to a younger audience. During the POP! shop, consumers chose from a selection of unique items, including vintage and contemporary fashions and accessories, and designer labels. Revenues generated from the shop are helping put people to work in Austin. Spokespeople Evette Rios and Lorie Marrero were on hand for the event. In 2010, Goodwill launched the Donate Movement to demonstrate the value that donated goods have for people and the planet. Goodwill's vision for the Donate icon is a universal reminder to 'recycle' through responsible donation, helping provide opportunities for others while diverting usable items from landfills. On the occasion of its 100th anniversary in 2002, Goodwill Industries launched an international workforce development initiative designed to integrate 20 million people into the workplace by the year 2020. Known as the Goodwill Industries 21st Century Initiative, the plan includes broad strategies for getting people into good jobs that enable them to become self-sufficient. These strategies include providing job and technology training for a 21st-century workforce, offering family strengthening services to support workers and their families, and developing business opportunities to employ individuals who were previously considered unemployable. As part of the Joining Forces campaign of First Lady Michelle Obama and Jill Biden, Goodwill has hired nearly 1,800 veterans and military family members and has served nearly 100,000 more with job training and placement services. In June 2013, Goodwill announced an initiative with the goal of engaging 3,000 women veterans[clarification needed] over the next two years with services and support that lead to economic self-sufficiency. Goodwill has policies on donations, including items that it can accept. It will only accept items that can be resold, whether in the retail stores or as bulk lots. Goodwill stores generally do not accept donations such as automotive parts, furniture showing signs of damage, large appliances including stoves, refrigerators, washers/dryers, or exercise equipment. Most stores also do not accept hazardous materials such as paint, medications, or building materials such as doors, wood, nails, etc. For liability reasons, Goodwill generally does not accept baby cribs or car seats. Sanitary regulations prohibit accepting mattress donations, and although some Goodwill stores sell brand new mattresses, most locations are unable. Recently, due to safety concerns, particularly lead content in painted products, some Goodwill stores do not accept certain toys. Goodwill will generally accept donations of clothing, shoes, books, accessories (handbags, belts), dishes, furniture in good condition, household decorations, small appliances including vacuum cleaners, and consumer electronics including alarm clocks. Even if they are deemed unfit to be sold in a store, these items can be sold as bulk lots, and thus can still generate income. Depending on local laws, the value of the goods donated can be used as a tax deduction. In 2005, Goodwill Industries of the Columbia Willamette (GICW), Goodwill's Portland, Oregon, branch, came under scrutiny due to executive compensation that the Oregon attorney general's office concluded was "unreasonable". The President of the Portland branch, Michael Miller, received $838,508 in pay and benefits for fiscal year 2004, which was reportedly out of line in comparison to other charity executives and placed him in the top one percent of American wage earners. After being confronted with the state's findings, Miller agreed to a 24% reduction in pay, and GICW formed a new committee and policy for handling matters of employee compensation. A 2013 article on Watchdog.org reported that Goodwill's tax returns showed that more than 100 Goodwills pay less than minimum wage while simultaneously paying more than $53.7 million in total compensation to top executives. Douglas Barr, former CEO of the Goodwill of Southern California, was the highest paid Goodwill executive in the country. He received total compensation worth $1,188,733, including a base salary of $350,200, bonuses worth $87,550, retirement benefits of $71,050, and $637,864 in other reportable compensation. "In 2011, the Columbia Willamette Goodwill, one of the largest in the country, says it paid $922,444 incommensurate wages to approximately 250 people with developmental disabilities. These employees worked 159,584 hours for an average hourly wage of $5.78. The lowest paid worker received just $1.40 per hour." Goodwill Industries International has been criticized by some for using a provision of federal labor law to pay workers with disabilities less than the federal minimum wage. Under Section 14(c) of the Fair Labor Standards Act of 1938, organizations can obtain a "special wage certificate" to pay workers with disabilities a commensurate wage based on performance evaluations. 7,300 of Goodwill's 105,000 employees are paid under the special wage certificate program. The National Federation of the Blind considers it "unfair, discriminatory, and immoral." Other disability rights advocates have defended Goodwill's use of the special wage certificate to employ workers with disabilities. Terry Farmer, CEO of ACCSES, a trade group that calls itself the "voice of disability service providers," said scrapping the provision could "force [disabled workers] to stay at home," enter rehabilitation, "or otherwise engage in unproductive and unsatisfactory activities." Goodwill believes that the policy is "a tool to create employment for people with disabilities" who would not otherwise be employed. Goodwill notes that "Eliminating it would remove an important tool for employers and an employment option available to people with severe disabilities and their families. Without the law, many people with disabilities could lose their jobs." Goodwill has urged Congress to "support legislation that would strengthen the FLSA and increase its enforcement," and to "preserve opportunities for people with disabilities who would otherwise lose the chance to realize the many tangible and intangible benefits of work." A 2013 FLSA fact sheet from Goodwill states that "Without FLSA Section 14(c), many more people with severe disabilities would experience difficulty in participating in the workforce. These jobs provide individuals with paychecks that they would be unlikely to receive otherwise, as well as ongoing services and support, job security, and the opportunity for career advancement." A coalition of smaller charities in California had complained about Goodwill's support for legislation encouraging greater regulation of donation boxes, calling the efforts an "attempt to corner the clothing donation market and make more money." Local Goodwills have argued that donation boxes divert money from the community and contribute to blight, and have pushed for state legislation that requires owners of a donation box to clearly display information about whether it is a for-profit or nonprofit organization. ^ "Return of Organization Exempt From Income Tax, Form 990" (PDF). goodwill.org. Goodwill Industries, Inc. 2012. Retrieved 14 Jan 2015. ^ "Is Goodwill a for-profit company or a non-profit agency?". sfgoodwill.org. Goodwill of San Francisco, San Mateo, and Marin. Archived from the original on 2013-10-02. Retrieved 14 Jan 2015. ^ "Global - Goodwill Industries International, Inc". www.goodwill.org. Retrieved 1 January 2019. ^ "About Us | Goodwill Industries International, Inc". www.goodwill.org. Retrieved 2017-01-12. ^ Heller, Steven (20 April 2011). "Joseph Selame, Designer of Corporate Logos, Dies at 86". New York Times. Retrieved 3 May 2011. ^ "Evette Rios Becomes Goodwill Spokesperson" (Press release). Goodwill Industries. July 18, 2012. Retrieved April 28, 2013. ^ "Methodist Churches in Boston Since 1792 - School of Theology Library". www.bu.edu. Retrieved 1 January 2019. ^ Lewis, John Fulton; America, Goodwill Industries of (1977). Goodwill: for the love of people. Goodwill Industries of America. ^ a b c "Celebrating the 15th Annual National Mentoring Month, Goodwill® Looks to Engage Volunteers throughout January". Goodwill Industries. 2017. Retrieved 2017-01-12. ^ Erb, Kelly Phillips (December 19, 2014). "12 Days Of Charitable Giving 2014: Goodwill Industries". Forbes. Retrieved May 17, 2018. ^ Burghart, Tara (July 2, 2000). "It's Not Your Grandma's Goodwill Store". Los Angeles Times. ISSN 0458-3035. Retrieved May 18, 2018. ^ Hosaka, Tomoko (1999-08-28). "Goodwill to Launch Auction Web Site". Washington Post. ISSN 0190-8286. Retrieved 2018-05-18. ^ Hartmann, Michael E. (February 2006). "Helping People to Help Themselves". Philanthropy Magazine. Philanthropy Roundtable. Archived from the original on March 14, 2013. Retrieved May 18, 2018. ^ "Goodwill's History". Goodwill Industries. September 8, 2009. Retrieved January 12, 2010. ^ Gladstone, Rick (May 18, 2003). "Bulletin Board; Charity in Cyberspace". The New York Times. Retrieved January 12, 2010. ^ a b – Autum Beel. "About Us | Goodwill Industries International, Inc". Goodwill.org. Retrieved 2011-12-10. ^ Brazao, Dale (January 17, 2016). "16 Ontario Goodwill stores shut down". Toronto Star. Retrieved May 17, 2018. ^ Leff, Lisa (November 28, 2010). "Goodwill thrives at San Francisco thrift store". Boston.com. The Boston Globe. Retrieved May 17, 2018. ^ "POP! : Goodwill® Debuts First-ever Pop-up Shop At SXSW". PRNewswire.com. Retrieved 23 March 2013. ^ "About the Donate Movement". Goodwill Industries International. Retrieved 23 March 2013. ^ "Goodwill Industries International - Goodwill's 21st Century Initiative". Retrieved 2010-06-03. ^ "Goodwill to Announce Women Veteran Hiring Initiativet". Archived from the original on 2013-07-03. Retrieved 2013-07-11. ^ "About GoodProspects". Retrieved 2016-07-27. ^ Abelson, Jenn (February 27, 2009). "Lead law puts thrift stores in lurch". The Boston Globe. Retrieved January 12, 2010. ^ Denson, Bryan; Kosseff, Jeff (December 20, 2005). "Goodwill chief agrees to pay cut". National Committee for Responsive Philanthropy. The Oregonian. Archived from the original on March 4, 2011. Retrieved January 12, 2010. ^ "Response to Oregon Department of Justice Audit Report" (PDF). Goodwill Industries of the Columbia Willamette. December 20, 2005. Retrieved January 12, 2010. ^ a b c Hrabe, John (6 May 2013). "Policies, tax dollars enrich Goodwill execs". Watchdog.org. Retrieved 16 May 2013. ^ "Leadership". Goodwill Southern California. Retrieved 1 January 2019. ^ "The Issue of Fair Wages for Workers with Disabilities". National Federation of the Blind. Retrieved 16 May 2013. ^ Hrabe, John (25 September 2013). "Goodwill's Charity Racket: CEOs Earn Top-Dollar, Workers Paid Less Than Minimum Wage". Huffington Post. Retrieved 16 May 2013. ^ "Americans with Disabilities to Protest Goodwill's Subminimum Wages". Press Release. National Federation of the Blind. Retrieved 16 May 2013. ^ Schecter, Anna (June 25, 2013). "Disabled workers paid just pennies an hour – and it's legal". NBC News. Retrieved June 27, 2013. ^ Hrabe, John (2013-05-15). "Goodwill Minimum Wage Loophole Will Shock You". Huffington Post. Retrieved 16 May 2013. ^ "Special Minimum Wage Q&A – and it's legal" (PDF). Goodwill White Paper. Retrieved 27 June 2013. ^ "Fair Wages Position Paper" (PDF). Goodwill White Paper. Retrieved 27 June 2013. ^ "FLSA Section 14 Fact Sheet" (PDF). Goodwill Fact Sheet. Retrieved 11 July 2013. 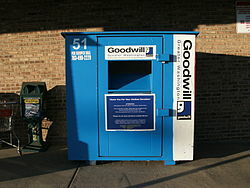 ^ a b "Goodwill pushes for greater regulation of donation boxes". CalWatchdog.org. 27 March 2013. Archived from the original on 29 July 2013. Retrieved 27 June 2013. ^ Hrabe, John (2013-03-27). "Nonprofits fight donation regulations". CalWatchdog.org. Retrieved 16 May 2013. Wikimedia Commons has media related to Goodwill Industries.